Have you ever wanted to make something but you were tired of making it the same old way? Today’s polymer clay tip will demonstrate how to take one idea and make 5 different things. Specifically? Polymer clay ornaments! [Don’t miss last week’s series of 5 polymer clay ornaments you can make in under 10 minutes each!] 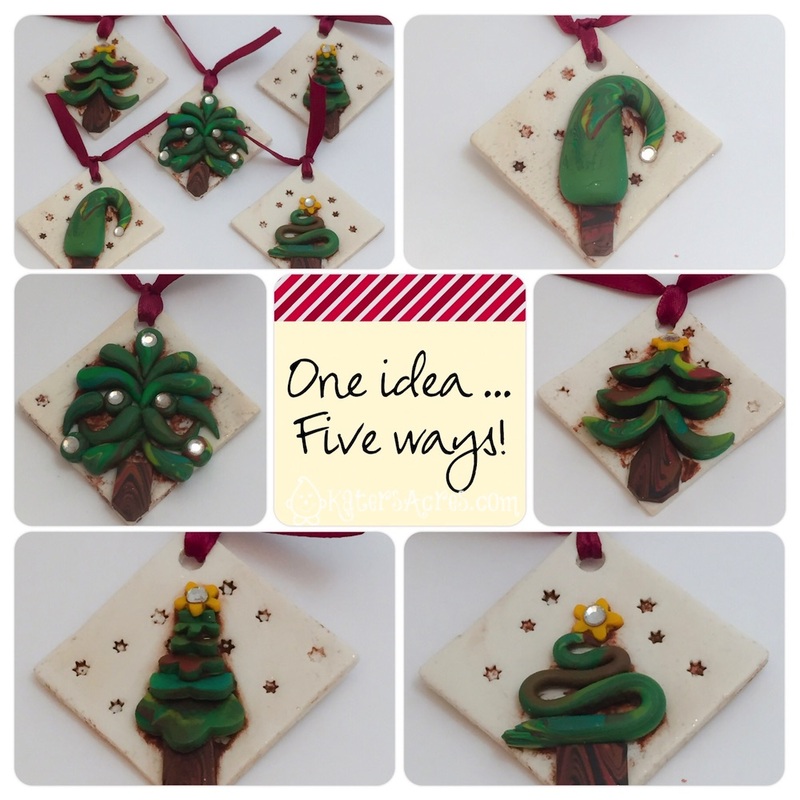 Today however, this one idea, five ways are not just any ornaments, but they are polymer clay Christmas tree ornaments with Christmas trees on them. Sounds boring right? Perhaps not as much as you’d think. I make a ton of polymer clay ornaments in my studio. I make them for giveaways, gifts, and generally just to have a good time. But sometimes I need a series of ornaments that look alike yet are all different. This mini-tutorial will show you exactly how to take one idea and make a series of ornaments from them. I know, sounds easy right? Well, sometimes it is and sometimes it isn’t. I needed a set of 5 ornaments with the same theme, colors, & looked matchy-matchy. So how about the time honored and sacred, Christmas Tree. Yep. Of all the unique and wonderful Christmas icons I could have chosen, I chose the Christmas Tree. To make this set look like they are buddies, partners in crime, siblings (if you will) they need an element of sameness. I decided that this sameness would not only be their color palette, but their background. For these simple ornaments make a background that is identical for each ornament. I chose my glistening snow recipe to use as the background. I then cut a place where the ornaments (which I’m actually using as tags) could be hung with a small round cutter. I then textured the background with a star shape. Again, to make this polymer clay ornament set look alike they need to maintain an element of sameness. Part of that includes my color palette. For these simple ornaments make enough of each color for the number of ornaments you are making. I chose to use the Christi Friesen look-at blend for my trees and made a custom wood grain for the trunk of all the trees. There are literally hundreds of ways to make a Christmas Tree. But … in case you are stuck, here’s mine: Charlie Brown Style, Swoopy Style, Art-Deco Style, Stacked Style, Folded Style. You can do this same thing with just about any Christmas symbol like a stocking, santa, reindeer, and so many more. You just have to challenge yourself to come up with ways they might actually look different. Thanks for stopping over Ann Marie. I’m so glad you liked it!